MakerBot Digitizer Desktop 3D Scanner | Order Today! Today we are pleased to announce that the MakerBot® Digitizer™ Desktop 3D Scanner is available to order at www.makerbot.com/digitizer. 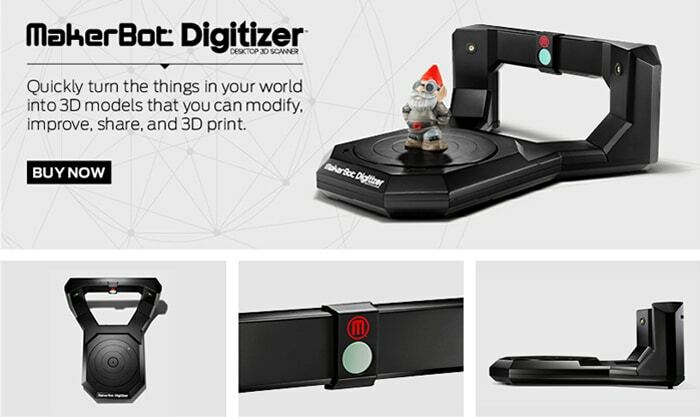 With a MakerBot Digitizer on your desk, you’ll be able to quickly turn the things in your world into 3D models that you can modify, improve, share, and 3D print. Shipping begins in October, so order now and prepare to be a pioneer in Desktop 3D Scanning! Here’s a message from our CEO, Bre Pettis. Scanning with the MakerBot Digitizer is a fast and easy way for anyone to create 3D models. It’s optimized for MakerBot Replicator® Desktop 3D Printers and MakerBot Thingiverse, so it’s simple to print out and share your 3D models with the world. Here’s what you can expect: • The MakerBot Digitizer runs on our simple, yet sophisticated software that creates clean, watertight 3D models with just two clicks • Turn physical objects into 3D digital design files in approximately 12 minutes • You don’t need any design skills, 3D modeling, or CAD expertise to get started • The output is a standard 3D model file format (STL) and can be modified and improved in third-party 3D modeling programs, like Autodesk’s free software MeshMixer • MakerBot Digitizer works seamlessly with MakerBot Replicator Desktop 3D Printers to let you make your freshly scanned models • Easily upload your scans to Thingiverse.com Visit www.makerbot.com/digitizer to order, see more pictures, and learn more about this exciting new addition to the MakerBot 3D Ecosystem. Full speed ahead!